I never thought that the coursework in a master’s degree in counseling would help me to survive a night of being stuck in Utah’s rugged, remote, and desolate Horseshoe Canyon. Nor would I have ever guessed that an education in counseling would help me transform my consciousness in a survival situation to be able to access my higher self and make the best of a dangerous situation, but before I get too ahead of my (higher) self, I’ll share my story with you. 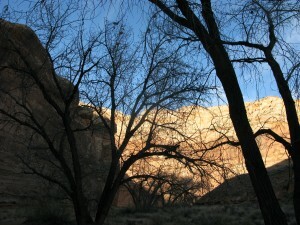 I set out to do some camping and hiking in southern Utah’s red rock canyon country. I had planned the trip for several months, bought maps, books, and plenty of camping and survival gear; as well I own a four-wheel drive truck to go far off the beaten path. What a lot of people don’t know about the four corner area consisting of southeast Utah, northwest New Mexico, southeast Colorado, and northeast Arizona is that the ancient ancestral puebloans that we refer to as the Anasazi People flourished in this land as early as the year 700 CE to roughly around 1,130 CE, and then disappeared, leaving behind countless cliff dwellings, petroglyphs, and ancient ruins. One of the greatest mysteries of North America is what happened to the Anasazi people and how did they survive in such a rugged land with flash floods, very little rain fall, harsh winters, and unbearable summers? According to a hiking book I read, there are only about 9 weeks a year of comfortable camping and hiking weather in southern Utah. In the middle of my Utah trip a friend flew out to join me for some camping and hiking. It was late March and the weather was great during the day with chilly but not too cold nights. We found ourselves about 36 miles down a dirt road going to a hike called the Grand Gallery that featured numerous Anasazi petroglyphs located in Utah’s Horseshoe Canyon. We were truly in the middle of nowhere, at least 36 miles from the nearest paved road, and about 60 miles to the nearest tiny hamlet of a town. I misread the hiking book and thought the hike was 3.5 miles round trip, when it was more like 6.5 miles round trip, so I did not have my normal amount of survival gear, water, and food that I generally carry on longer hikes. My friend, dog Buddy, and I set out on the trail down the canyon. After we reached the canyon floor we saw a ranger who told us that we should not spend more than an hour in the canyon in order to get out before nightfall and that the Grand Gallery was further than what we read in my book. We thanked him and continued on our way. After roughly an hour I told my friend that I thought we should head back so that we didn’t get lost in the dark. My friend assured me that she had done a number of night hikes, and that she would be able to find the way back. My gut told me to turn back and that this could be dangerous, but instead of listening to my gut, I wanted to trust my friend and continued the hike. We arrived at the Grand Gallery and took pictures of the various ancient petroglyphs drawn on the red rock canyon walls. 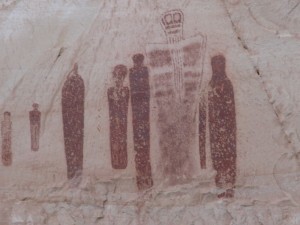 Southern Utah is one place that I can really feel the sense and presence of ancient civilizations. The land is extremely remote, and hardly any people in this day and age live in southern Utah’s canyon country. The land is wildly beautiful, and many ancient ruins still remain throughout the landscape like hidden gems in the rough. Little did I know that we would end up being lost in this wild and remote place. The sky grew dark and the moon must have been the darkest it ever gets. We had one headlamp and were walking fast down the trail to find the way up and out of the canyon. After some time the headlamp was running out of batteries, the night grew very dark, and the air became freezing cold. We were lost in no man’s land down in a canyon in the middle of nowhere; with hardly any water, food, or light, with a small 16 pound dog who was shivering. All I knew at this point was in order to survive we needed a fire, and luckily in my backpack I had two lighters. We started to look for tiny twigs, bark, dried dead leaves and made a pile with larger twigs on top. With two clicks of the lighter we had an instant fire. Next we pulled out small fallen trees and driftwood that ends up in canyons after flash floods. We had a good sized fire going and my dog was starting to warm up. We went through our belongings and realized how little supplies we had, and that we had hardly eaten or drank much that day. We decided to dial 911 on my phone, but with no phone reception, nothing happened, and no one came. We decided that we would make the best out of our situation and that this must have happened in order to teach us both an important life lesson. Exactly one year ago on the same night, I was on a Wilderness Fast through Southwestern College where I fasted in Death Valley California alone for 4 days and nights. This was one of the most inspiring, empowering, and peak experiences of my entire life. My friend had also been on a Wilderness Fast a few years before me. We were able to tap into the connection we had with the earth from our Wilderness Fasts, and knew that no matter what, we would survive this night and that the universe would support us. I found deep gratitude in the gift of fire and how we were able to stay warm, and that we were both in good health. We had just enough in order to get through the long dark night, and instead of going into panic, arguing or blaming; we found peace, strength, and gratitude through our now very large bonfire. We ended up pulling dead trees out of the wooded canyon corners, stomping and slamming our feet on the branches and trunks in order to break them up and fit them into the fire. We kept our survival inferno going for 11 hours straight, the wood was so dry and brittle from the desert sun that no matter how much wood we piled up on the fire, it would all burn within 2 hours. Still with hardly any water or food, in the dark below-freezing night, we kept the fire burning at all costs and awaited the morning light. Morning came and it sure was cold, the coldest time of a 24-hour period is generally the time just before the sun comes up. We were exhausted, but still finding dead trees to break down in order to stay warm during sunrise. The canyon finally lit up and was just warm enough for us to try to find our way back. We ended up seeing some hikers who gave us water and showed us the way out and back up the canyon. We made it back to my truck and headed down the long dirt road back into civilization. This was a night I will never forget, and a lesson that I am still learning from. I learned how to stay calm and access my inner resources, and coping skills in order to think clearly and find peace within myself, from my course work and Wilderness Fast at Southwestern College. From the consciousness centered education at Southwestern College, I had developed many inner resources, and the ability to look past my normal reactions to reach my higher self. Tapping into the peace and love that lives inside me, I was able to have a healthy and peaceful state of mind, think clearly, and be able to survive a dangerous situation. To my surprise, the Master’s degree in counseling I’m in and classes I’ve taken ended up helping me mentally to survive in the wilderness, find gratitude, and be able to find the positive in a difficult situation. So far from the lesson of this night, I now know to always trust my gut feeling. However I still feel there is much more from this lesson that I have not yet fully realized. Lastly, from that night in Horseshoe Canyon, I have a story of higher self and survival that I will remember for the rest of my life.